Month’s of Ramadhan is the month where all Muslim in the world fast( not drink and eat from morning till dusk) for 30 Days in Ramadhan. Touge activity maybe still active in some groups after Tarawih Prayer in weekend. 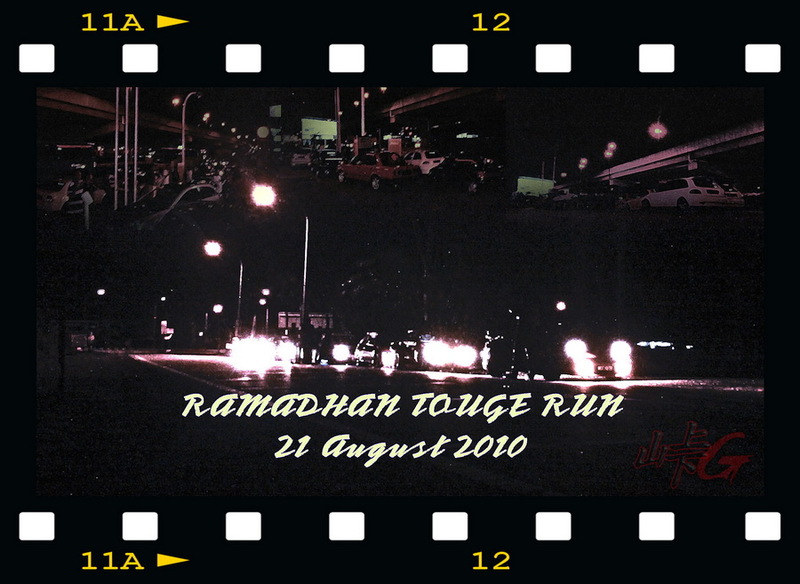 Here 5 Touge Runs Report for this Ramadhan 2010. A touge run which has been planned by Takashi and organized by Rizal. After a week post RSVP in Facebook, 29 touge runners participated in this event. 18 of them are from MySat & Yosato club of Proton Satria owner. Our friend from Senawang also came took part for touge and learn touge environment in Gombak. Shell near Sri Gombak was a place for meet up then we moved to Petronas Selayang for briefing. We split into 3 groups which group 1 led my Sw20, group 2 by Rizal & group 3 by x-zam. We drive along Jalan Ulu Yam and stop at junction Jalan Batang Kali – Genting Highland for re-gather. Some of runner in group 2 join group 1 for balance all group. Group 1 move well and arrive safely, but in group 2 there got 1 Satria overheated at a hairpin and 1 Satria involved in crashed and fallen into big drain due to technical problem. Thanks to god that the driver and co-pilot was safety and no one injured in this scene. The ride been towed to Selayang now has been recover from misery. Mysat & Yosato take a leave while the rest continue journey to Awana Mamak for “Tea Breaking”. Sw20 also leave after had some meals and head back to KL through highway. Now whose left is, 120y, wex2, redBmW, Citi-Z, rizal & x-zam neo, kelisa, black neo, & kancil turbo. After finished “tea break” we went downhill genting go to Sempah for touge downhill session. Everyone runs well on sempah touge while ariffin with his cousin, amir took a pleasure drive and stop by to “skodeng” gaung area. Finished touge, zali, kel-vin and “x-zam” headed home and the rest went to some malay restaurant for had “Sahur”. At 6.00Am, everyone back to home. Its Saturday Night, a week after incident at Batang Kali. Before the night, I already went up to Sempah alone for Breaking Fast at McDonald R&R. Looking out the environment and surface at sempah. Everything was perfect except at quarry bridge sector where got some small stone over the area. For the night planned, firstly Shazwan DC5 from Shah Alam contacted me for Touge Run after midnite. But, everything was changed in their side, his friend want move out after Tarawih at 10.30pm and went up to genting at 11.20pm. When I try to reach him at 1.00am, they already back to home. At the bridge of BT12 Gombak, only 3 ride tonite. There was 120y, me and satria khalil. Mizta also join and be co-pilot to assist khalil on the touge. On uphill section everything run smooth, the weather so clear only windy. After reach and lepak at Awana Mamak, we go back to sempah. On the way back there, suddenly heavy rain fallen from the sky. Ahh.. It’s not what we expected. Damn! My rear wheel sidewall condition is super botak(bald) and its mid was 10% of tread only. Stock tires from Proton still in used. Try to maneuver the car at every corner. The rain still fallen when we reach at sempah touge, from heavy rain and it slowly stop when we reach at middle of sempah touge. Everyone drive slowly but I was too boring then press a bit on pedal on the wet. I already 1 month sleep from touge and just want to get back on the both dry and wet surface. Mostly just be as co-pilot all the time in 120y hell rides. We arrived safely end of touge then headed back to home. It’s just was an unplanned touge, actually there will be no run for tonite and I want get sleep early. After berbuka I sms to Xanakas and wish him Happy Merdeka. He was at Senawang with his friend. He asked me about tonite program and I told him that maybe have a run for Merdeka Eve but it was still unplanned and there was no comfirmation among each other. Before going to sleep, I check out and surf the internet, e-mail, fb, youtube and etc. At 11.30pm jasril called me and ask if there any runner for tonite. 11.34pm, got 2 sms, khalil ask me where I hangout tonite but in the same time Bernard sms me and ask for lepak at Dataran. OMG!, Dataran on this time, I refused the invitation because in don’t like the crowd and he didn’t ask about touge so maybe he don’t want go up for touge and forgot about khalil msg. I also checked out in the fb but there was no member talk about touge tonite. At 12am like that I entered my bedroom and took a nap while fireworks started Bang! Bang! Bang! from outside. After a while I fallen to sleep and the gate to The World Of Dream has been open slowly. Suddenly… vroooottt… vroooott.. Ahh! My dream was just gonna start, who’s now. I checked my sms, it was Mizta who sent me a msg at 12.28am. He told that he wanna went up sempah with DHK(Khalil) and I replied that Rizal already at peak of Genting with his wife. Damn! I just feel refreshed and go charge up my phone. I contacted jasril to get ready and msg Xanakas and ask his location, he was at Sepang that time on da way to KL. I told him about the run which maybe he can join together with us tonite. He maybe cannot get to Gombak at 1.30am so I told that we move on first while waiting him at Awana Mamak. 3 Rides ran from Gombak, it was 120Y, Persona and Satria DHK which drive by Mizta. Uphill session at sempah run smooth, tarmac was semi-wet for touge. 120y led us and chased by Mizta while Persona took last place watch both of them touge. Both of them ran fast and I been leave 1 corner behind. hahaha.. I thought it was dry surface. Front tires pressure about 32psi and it was not suitable for wet touge and I don’t mind about rear pressure because it still same even put at low pressure surely tail-dance also. Botak tepi.. haha again to me, terkena tonight. About 10 minutes later, Xanakas arrived with his red number 8 Of GSR model. On the same time, jasril was helping 1 waja taxi driver which had some problem. The taxi driver also join us had a “tea Break” together. What a beautiful Merdeka night help each other. at 4.00am we start headed back to sempah. The road surface still wet and need to be alert while driving. we gather back at sempah and ready for downhill touge session. At sempah, the road still semi-wet and I don’t think the leader will run fast. 120y took a led while followed by number 8, Satria DHK, Persona pasar and Galant 1jz. But unlucky, 3 lead car finished till bridge at bt 12, takashi had to turn back after received a call from Bernard which had crashed in the middle of sempah. The galant 1jz was stuck at S corner after failed to brake on wet surface and hit the wall and he stuck inside while his co-pilot manage to get out. We help to bring out the driver from misery, I called the other who already finished the run. Bernard right hand got crack and bloody. I & mizta bring him to Tawakal Hospital while other pull out the car and called out tow truck. Bernard needs to stayed in Hospital for medical and released on 2 sept. The car was towed and we back home at 6.30am sahur at mcd Mrr2. Another lesson we got that night. In evening of 1 September before “breaking fast”, jasril sms’ed me and sound “jom touge malam ni, post la kat fb ajak sorang dua member”. Eh! I’m weird, why suddenly he asked for touge so so early. So I post at fb for calling out friends. Asraf member of Xanakas replied and said want to join with “hahaha” comment, I thought he just joking, but when lepak at Bistro, he and Xanakas already on his way to our location. Omg! I just planned to lepak2 at Bistro tonite, but now 120y need me as co-pilot and videoman. We went up to Mamak Genting with 3 rides, 120y chased close by Evo8 which drove by acap while the owner, Xanakas be as co-pilot and followed and recorded in friends neo. We had “tea break” and chit chat at Mamak before went back to home for sahur via Sempah touge. 120y led the run followed by Neo UntaJet and The Evo and now mr. Xanakas drove it. 120Y ran and doesn’t look at back leave Neo UntaJet & Evo behind. At first C hairpin, Neo UntaJet let The Evo passed and Evo start on full pedal. The sound of blow-off making noise in the jungle. at straight point before the second C Telecommunication Tower Hairpin, The Evo run in full throttle and ready to take right turn. But it was a mistake, its Left C Hairpin. He brake over the slope and the car wont stop, go straight and he managed to counter back the steering. DANG!! Crashed by hit the tree and the car stop there. At right side was a deep ravine and lucky he not fallen there. The Neo UntaJet contact the 120y and told the story. Ouch! This was a third crashed in month of Ramadhan which involving the brand name of Mitsubishi. The first crashed at Batang Kali, a Satria who’s used GSR Turbo Engine. Second crashed was Galant which a Mitsubishi Brand but use Toyota 1JZ Turbo Engine. Now, the full spec of Mitsubishi Evolution VIII. Jasril who had radio, try so many time to contact help from his handy. Lucky got 1 uncle name’s Pak Shukur who covering Genting area came to lend some help. He contacted 1 near truck to pull out The Evo from the crashed scene. The evo was sent to nearest workshop at the starting grid of downhill touge for overnite. The UntaJet and Taka sent our friend back to his home. Along the journey, UntaJet & acap was chatting about motorsports, while Xanakas the owner of Evo just silent and thinking about the misery and recovery plan. After sent them to Xanakas home, me and UntaJet headed back to Gombak for rest. Its morning already, and all people has wake-up and ready to work. Ahh.. Why Touge is so risky even it was fun. Remember.. The Misery always hunts us in the Touge. Once we forget it will take us. Be careful on touge. Raya was close. A week before 5 September, shazwan was call me and told about touge. He was planned to have a run on Saturday night of 5 September with his group and want to know how was Sempah Touge. In Saturday evening I almost forgot about the but before Shazwan call and remind me before berbuka puasa. After breaking fast I msg some of my member for confirmation who else want to join. The first person I contact was mr 120y, then Rizal, mizta, azim, khalil, shalie, and Wex2. But shalie, khalil & wex2 cannot make it due some circumstance. Other contact person who participated in this touge cruise was Fazham, Malcolm, member of BlackNeo and other persons which I not remember name. At 1.00am all member and shazwan group meet up at Twin Shell petrol pump at MRR near exit to Karak Highway. Shazwan introduce his self and his members to us. He was member of NorthernTouge in Kuala Lumpur who’s own Honda DC5 but now still in workshop due to problem with gearbox. He bring along 10 various rides like VW Golf R32, Impreza, 180SX, Myvi, wira, kelisa and others. Total rides about 19 car and manage to split into 2 groups. First group was went up to genting awana through UluYam-BtgKali while group 2 was took Sempah uphill to genting. From mizta story, there was an accident involved A Tourist Bus at Post 1 Genting. The bus was failed to brake and hit the stone barricade and crashed to another side and block road to uphill genting awana. A bit traffic jammed for a while before the police divide downhill side in to two way. Group 1 arrive 1t at awana mamak, then shazwan and his member went up to top uphill for drift session between 180sx and Impreza. I wonder how it done because I wasn’t there. I just stay at mamak waiting for group 2. Mizta who led group arrived after 20 minutes. Azim bring along his sibling and cousin joins the touge. We rest up for a while and chat among each other sharing some story. At 4.00am we went back downhill to sempah for touge cruise session. Shazwan and members met us again at Roundabout Sempah. The 180SX perform drift test at the roundabout. Good job bro 180. I manage to record some of the action. Yay! It will be show at youtube after I finishing this writing and video editing. Azim and some rider missed the exit to sempah and back home through highway. Ouch! Its okay babe, thanks for coming 🙂 We went back through jalan lama Gombak-sempah in cruise mode. Rizal done a good job be as scouter while mizta led the cruise and followed by others. Arrived at Bt12 Gombak Bridge, we salam among each others to back home. Some of us was sahur together in greenwood. After azan subuh, we all move to get some rest on bed with bantal busuk. Thanks for Shazwan invited us together sharing the moment of touge tonite. See ya on next run. hahaha… nice one weiii… but ape2 pon i’ll come down after raya… since yesterday the road was wat n slippery… very dangerous to all of us…. Just to inform that Shazwan passed away last Thursday morning. His DC5 crashed at karak highway. thanks for your news mr.azrul. Al-Fatihah & Takziah for his family. I got the news about 12.15pm from Nik Izwan who’s pm me at facebook. May Allah bless Shazwan Shahidan.